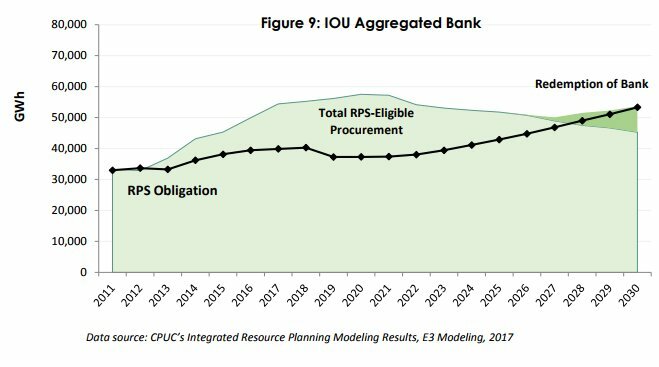 The California Public Utilities Commission recently released its annual renewables portfolio standard report showing that large investor-owned utilities have already executed the renewable electricity contracts necessary to exceed their 33 percent RPS requirement for 2020 — and are on track to meet the 2030 RPS requirement of 50 percent renewables a full 10 years early. If the renewable energy transition isn’t managed well, it could create a disaster scenario, according to Gary Ackerman, executive director of the Western Power Trading Forum, a broad-based membership organization dedicated to encouraging competition in Western states’ electric markets. Most Californians want the state’s electricity grid to be totally renewable. According to a poll conducted earlier this year by the Public Policy Institute of California, 76 percent of adults and 71 percent of likely voters — including 81 percent of Democrats and 53 percent of Republicans — approve of a 100 percent renewable energy requirement. The question facing policymakers, advocates and industry leaders now is how to fit all of the pieces together to make 100 percent possible. Just getting to 50 percent renewables in California is going to require some major investments. According to a Wood Mackenzie analysis, under a 50 percent RPS with solar making up the majority of incremental additions (43 gigawatts of incremental solar and 2 gigawatts of incremental wind), an additional 10 gigawatts of flexible capacity — a combination of thermal generators, hydropower, demand response and energy storage resources — would need to be procured by 2030 in order to meet the system’s ramping needs during the shoulder months. Brown acknowledged there are a lot of politics involved in the regional grid debate. “That kind of vulgar politics, which I’m so attracted to,” he joked. 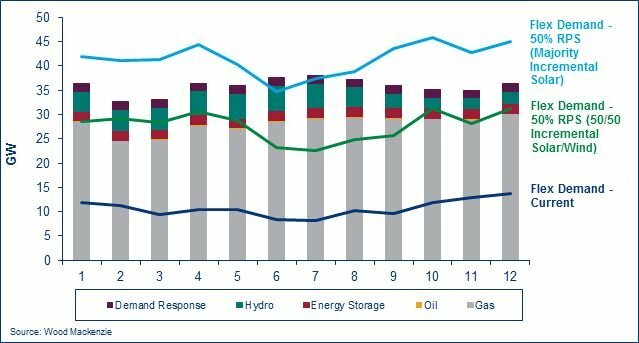 Because of that departing load, PG&E projected RPS energy requirements (in terawatt-hours) barely grow from today’s levels, even though the RPS requirements increase from 33 percent in 2020 to 50 percent in 2030. 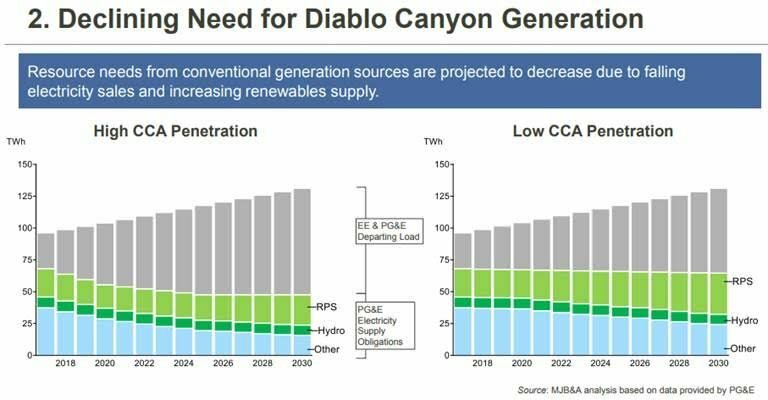 Falling electricity sales combined with the increased renewables is squeezing conventional generation out of the system, which is why PG&E decided to close the Diablo Canyon nuclear plant. A recent CPUC report questions the commission’s authority over CCAs, which has “somewhat reduced the most optimal procurement and coordination of resources and utilization,” staff reported. The shift to localized decision-making adds complexity to system-level procurement plans, which could make it harder — or at least more expensive — to meet a 100 percent renewable energy target statewide. To help get all players on the same page, the CPUC recently issued a proposal that, if adopted at the commission’s meeting on Jan. 11, 2018, would require CCAs to fully comply with CPUC Resource Adequacy rules before they can start serving customers. The move is designed to ensure sufficient energy generation is under contract, by the appropriate utility, to meet peak demand for the coming year. Uncertainty surrounding the expansion of CCAs, regionalization and the pace of energy storage technology development will surely persist into 2018 — which is Brown’s last year in office. Amid all of this, getting to 100 percent renewables by 2040 is not “out of the question,” as Brown said — but it raises a lot of them.